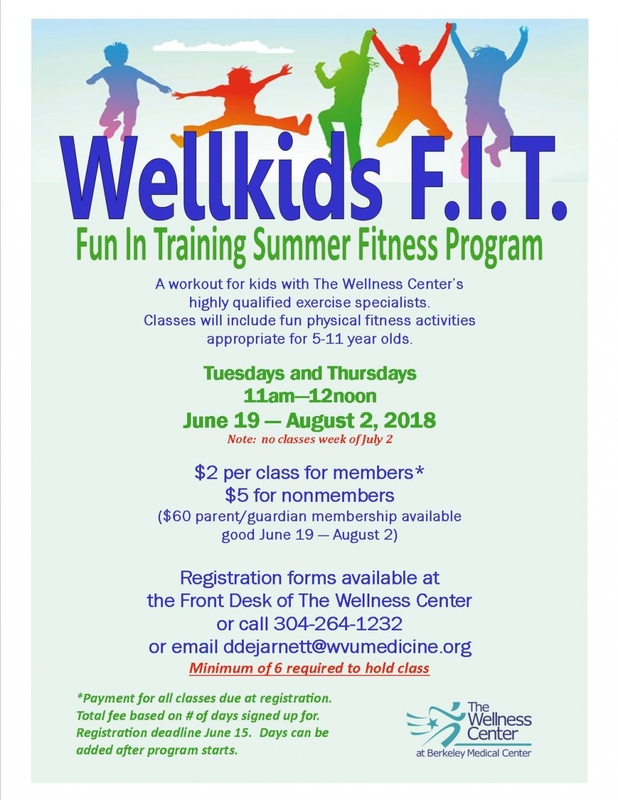 MARTINSBURG, W.Va. - The Wellness Center at WVU Medicine Berkeley Medical Center announces a youth summer fitness program, Wellkids Fun In Training (F.I.T.). Children between the ages of 5 and 11 can participate in this fitness program. Wellkids F.I.T. was created as a workout for kids while their parents or grandparents are working out in the fitness center. The Wellness Center is now offering this program to the community. Children and their parents/guardians do not need to be a member of the center to participate. The program begins June 19 and ends August 2. Wellkids F.I.T. is offered on Tuesdays and Thursdays from 11 a.m. until noon. There will be no classes the week of July 2. The cost is $2 per class per child for Wellness Center members, $5 per class per child for non-members. Payment for classes is due at registration, and the deadline for registering is June 15. The Wellness Center is offering short term memberships for parents and grandparents that are not currently members and would like to use the center while their children are working out. The short term membership is $60 and valid June 19 through August 2. Childcare is also offered for younger children and days Wellkids F.I.T. is not in session. See any Wellness Center staff member for more details.